Twitter is freaking out right now over news that Osama bin Laden is dead. Jill Jackson, a producer for CBS News, seems to have broken the story on her feed. Major news organizations like The New York Times and CNN have confirmed it. President Obama has called a news conference. Up-to-the-minute updates after the jump. UPDATE 12: CNN reports that bin Laden has been buried at sea. UPDATE 11: Someone has mapped the compound where bin Laden was hiding in Abbottabad, Pakistan, north of the capital. 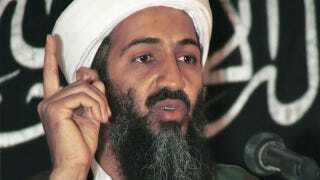 UPDATE 10: The New York Times has a 5,000-word Osama bin Laden obituary up. UPDATE 9: Obama: "Today, at my direction, the United States launched a targeted operation against that compound in Abbottabad, Pakistan." Watch the full announcement here. UPDATE 8: 11:35 p.m. ET The president approaches the podium to deliver his announcement. It's Obama-official: bin Laden is dead. UPDATE 7: President Obama is almost one hour late for his announced remarks. They will be worth the wait. UPDATE 6: John King confirms his death at 11:15 p.m. ET, via an official White House memo. It calls for heightened terror alert state. Adjust your Facebook privacy settings accordingly. UPDATE 5: Wolf Blitzer said bin Laden's body was transported to Afghanistan — not confirmed. UPDATE 4: CNN is reporting he was killed in a military action on a palace outside Islamabad, Pakistan. Family members were also killed in the attack. UPDATE 3: Jackson has just tweeted that "two congressional sources" have confirmed bin Laden's death. That guy is looking deader by the minute! Still waiting on the president's remarks. UPDATE 2: CNN says bin Laden is dead, citing "sources."